Badenoch and Strathspey: Waxwings at Nethybridge, near Loch Garten Junction (John Poyner). 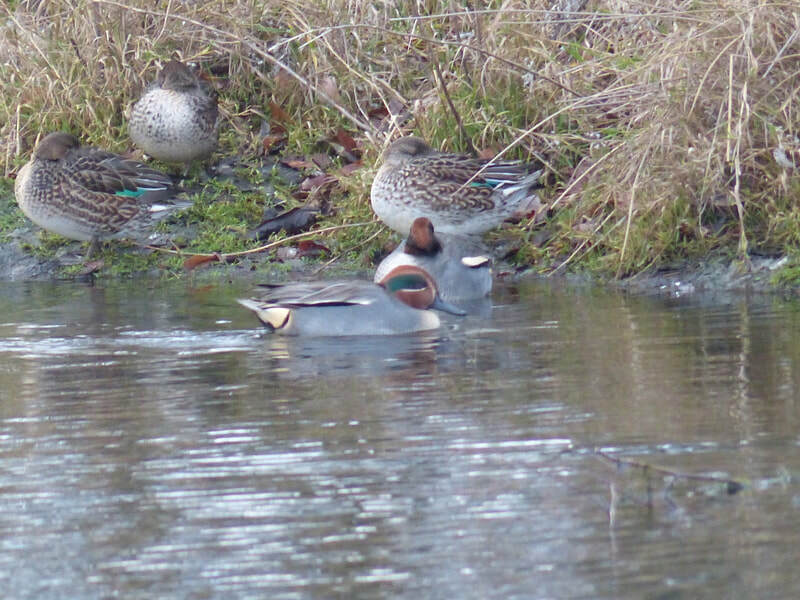 Easter Ross:​ Green-winged Teal still at Tain Links (Bob Swann). 13 Pale-bellied Brent Geese at Rosemarkie (Alister Clunas). 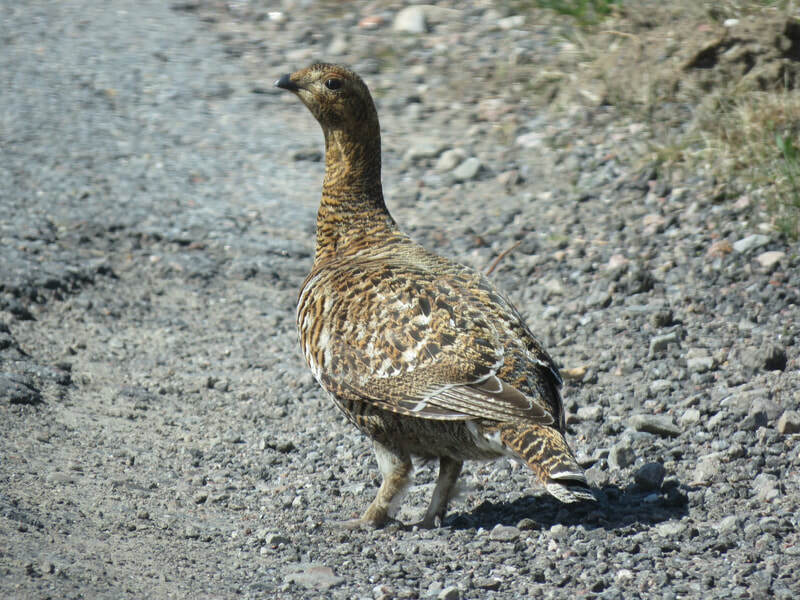 Easter Ross:​ American Wigeon still at Tain Links (Bob Swann).​ Male Hen Harrier quartering the fields immediately to the south of Tarbat Ness Plantation (Dave Tanner). Pair of Ruddy Shelduck from Ivy Cottage lay-by, Jemimaville (George Gay). Little Egret Back of Keppoch, Lochaber (Bob McMillan). 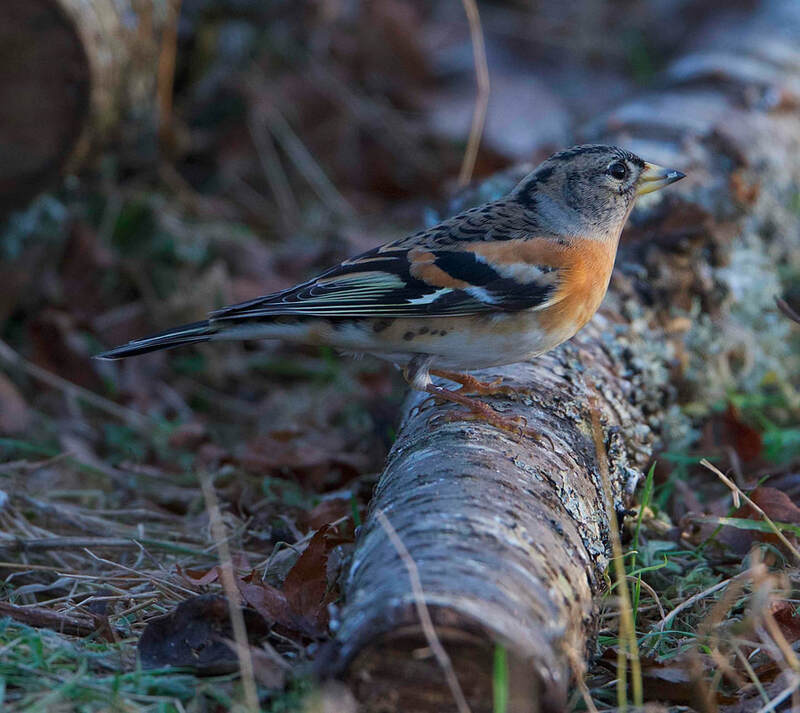 Sutherland: c100 Brambling. 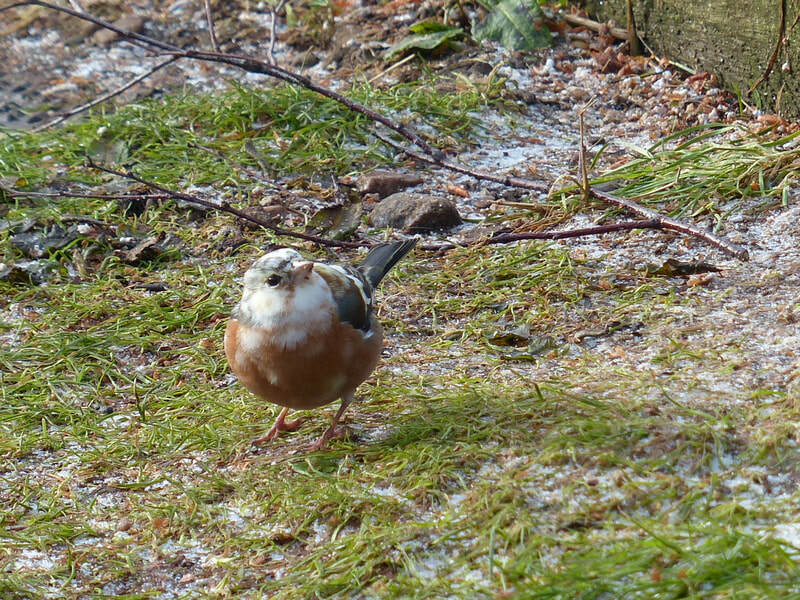 25 - Reed Bunting and c50 Chaffinch in stubble field just SE of Loch Fleet (Dave Tanner). Badenoch and Strathspey: Barn owl hunting in the daylight at Insh Marshes beside the railway line (Kevin Cuthbert). A flock of ten waxwings on Meall a’Bhuachaille by Glenmore at 550m (Pete Gordon). 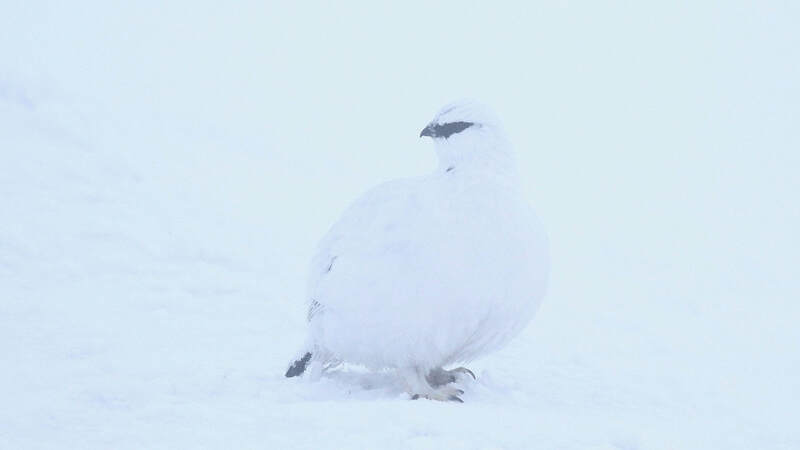 Wester Ross: 2nd calendar year Iceland Gull at Loch Kishorn (Bob McMillan). 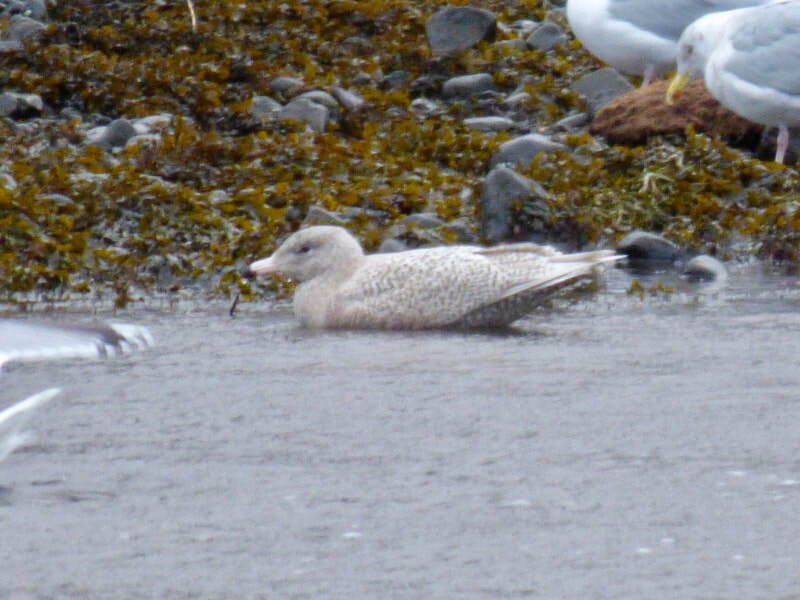 Skye and Lochalsh: 2nd calendar year Glaucous Gull at Portree (Bob McMillan). Easter Ross:​ American Wigeon still at Tain Links (S Levene). 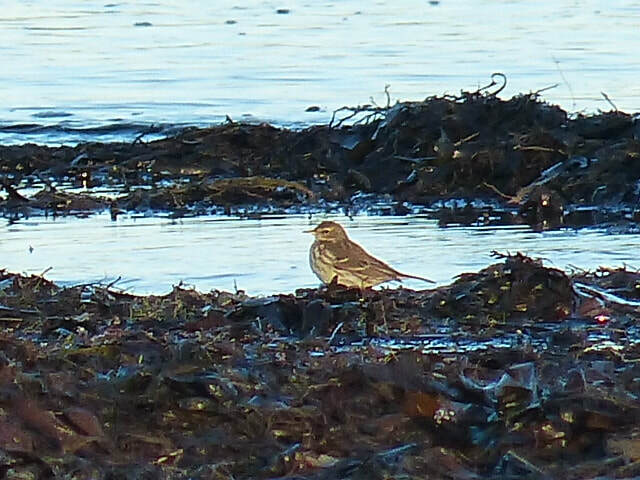 Sutherland: Water Pipit still at Dornoch Point (Via Rare Bird Alert). 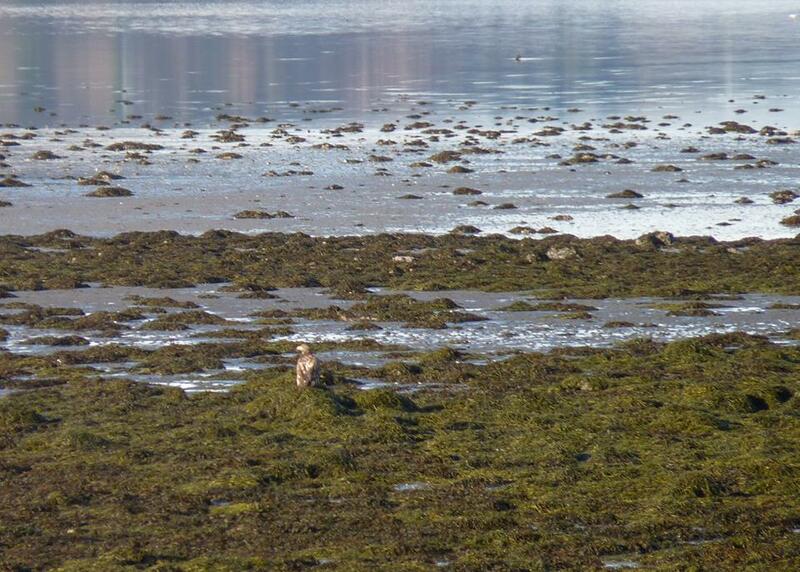 Immature White-tailed Sea Eagle over Loch Fleet (Ann Sime). 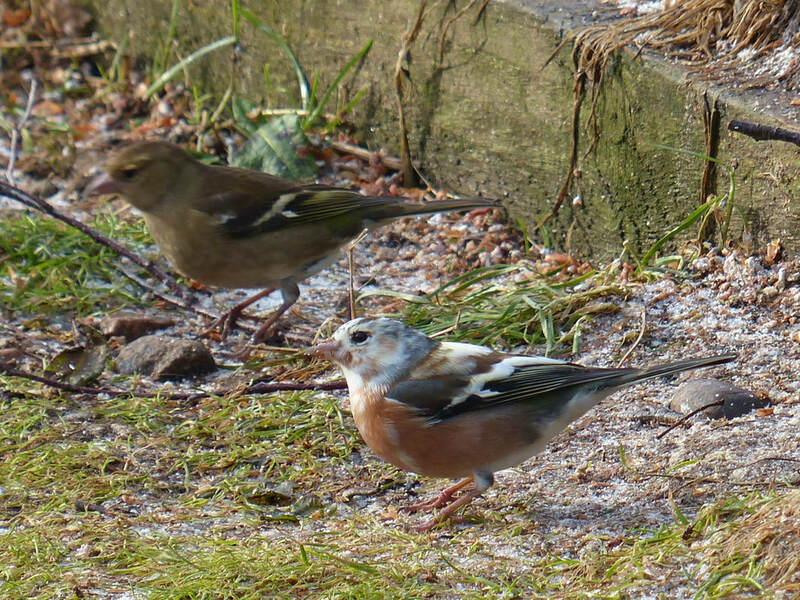 Leucistic Chaffinch at feeders at The Mound, Sutherland (Dean MacAskill). Sutherland: Reported "White-billed diver" at Loch Clash (M Sheddan). Easter Ross: Intermediate morph Snow Goose with Pink-footed Geese in field along unclassified road starting opposite Munlochy Church at NH640522 (Bob Wilson). Skye and Lochalsh: Adult Mediterranean Gull in Broadford Bay (M Benson). 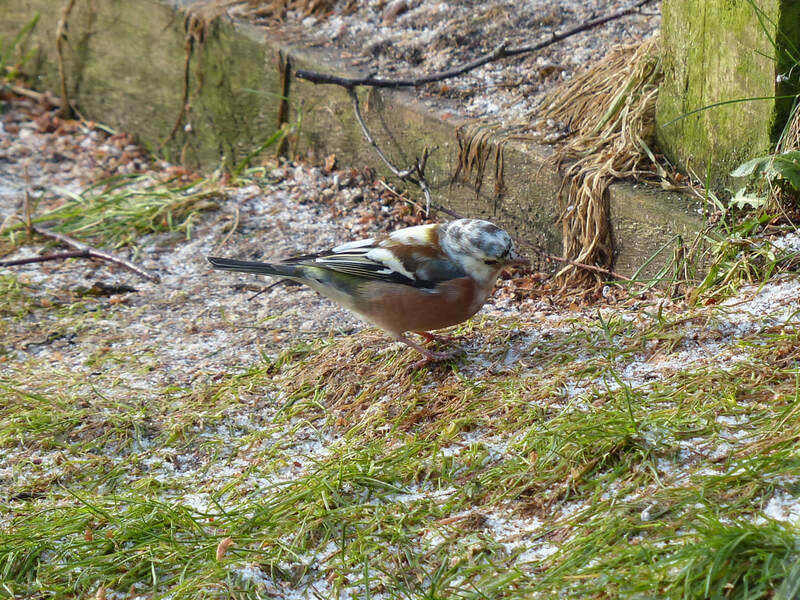 Lochaber: Mandarin drake with Mallard at Camusdarach, Little Egret at Arisaig / back of Keppoch, Juvenile Iceland Gull at Inverailort (Via Bob McMillan). Hybrid Barnacle x Greylag at Cromdale (Kevin Cuthbert). 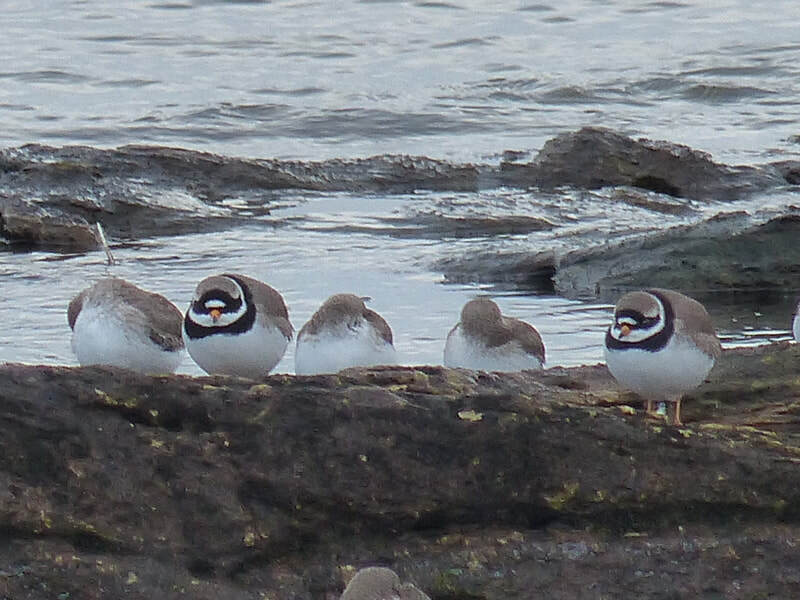 Sutherland: ​7 adult and 2 1st winter Little Gulls feeding at Brora river mouth (Dean MacAskill). Hybrid Ross's x Snow Goose, Strathdearn (Mark Keighley). Sutherland: Juvenile Little Gull off Brora Beach car-park though distant. 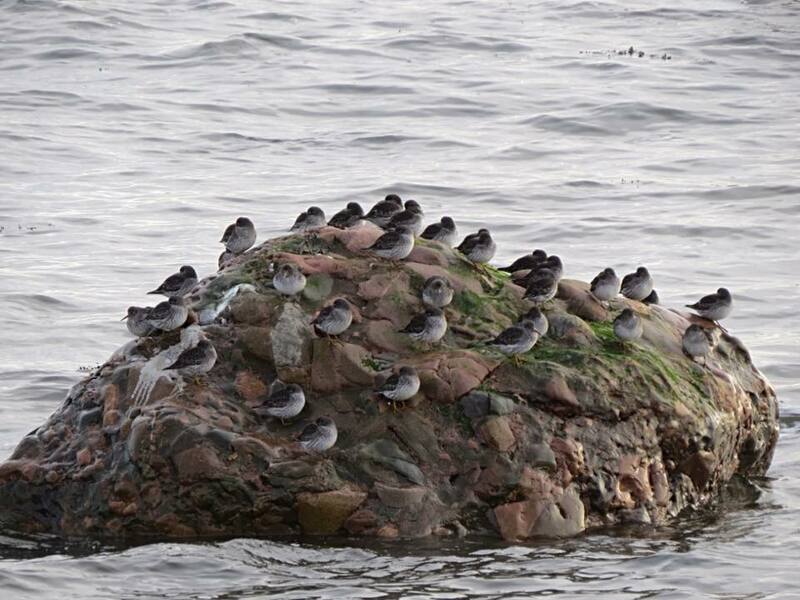 Also circa 35 Purple Sandpiper on rocks on the rising tide (Dave Tanner). 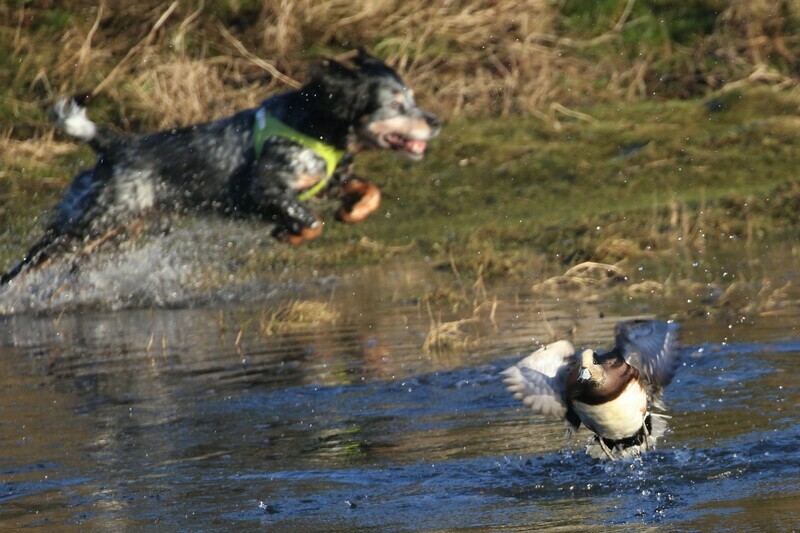 Easter Ross:​ American Wigeon and Green-winged Teal still at Tain (Dave Tanner). 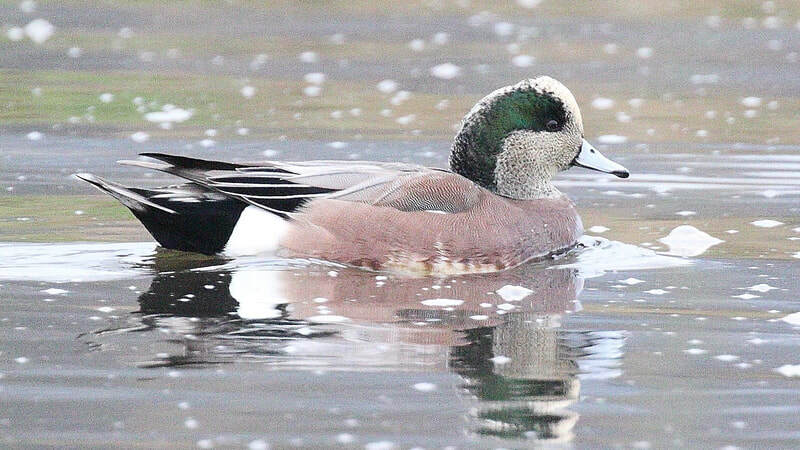 America Wigeon, Tain (David Tanner). 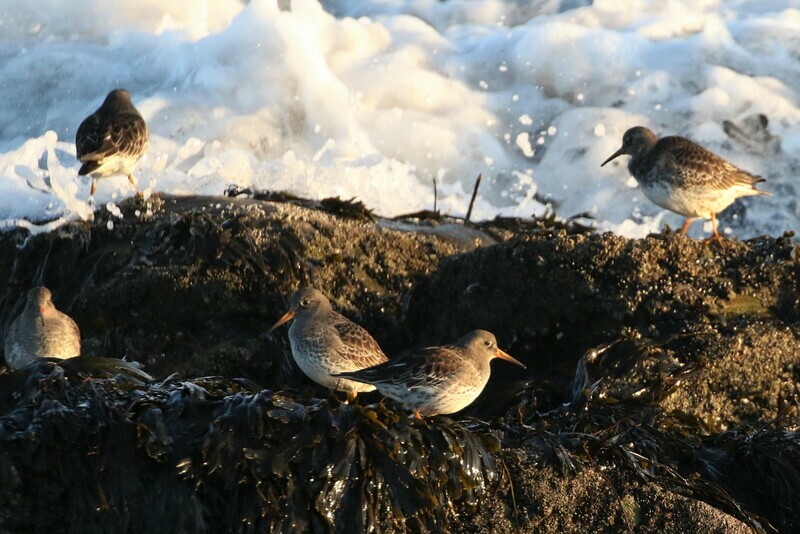 Purple Sandpipers, Brora (David Tanner). 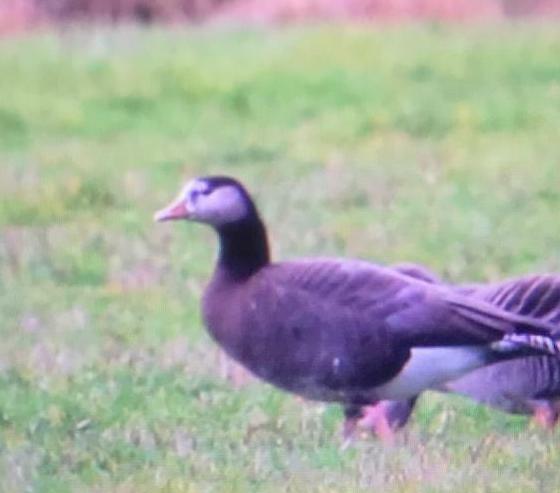 Inverness: 4 Barnacle Geese and a Pale-bellied Brent goose with Pink-footed geese flock along the B9039 just before Castle Stuart (Steve Broyd). Skye and Lochalsh: Still 7 Greenland White-fronted geese in the wintering group at Kilmuir (Bob McMillan). 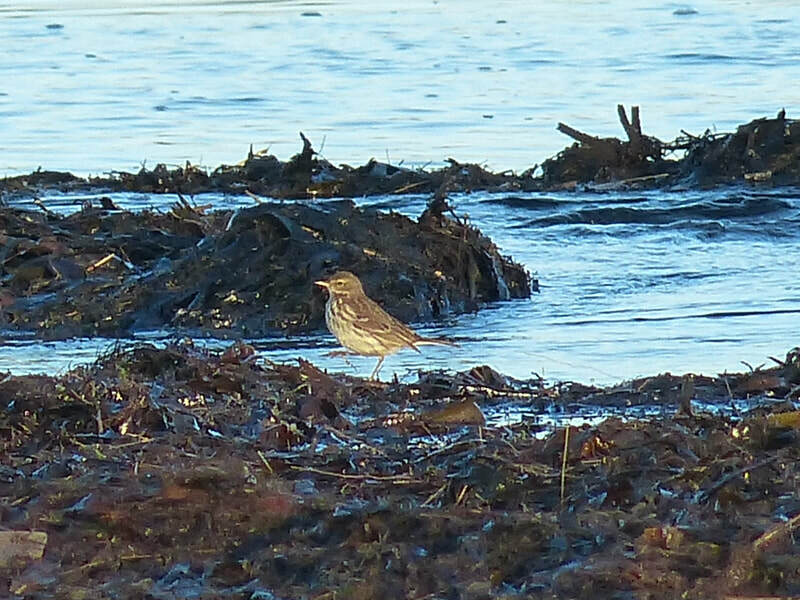 Easter Ross: Water Pipit still at Dornoch Point today (Dean MacAskill). 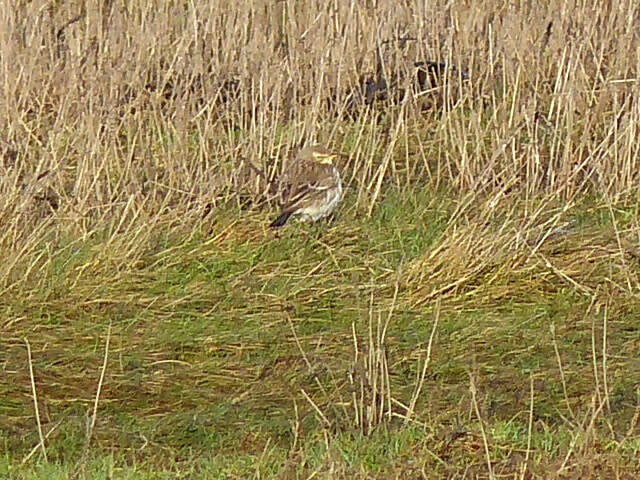 Water pipit still on the west side of the Dornoch point with Rock pipits (Dean MacAskill). White-tailed eagle, Loch Broom, Ullapool (John Palmer). 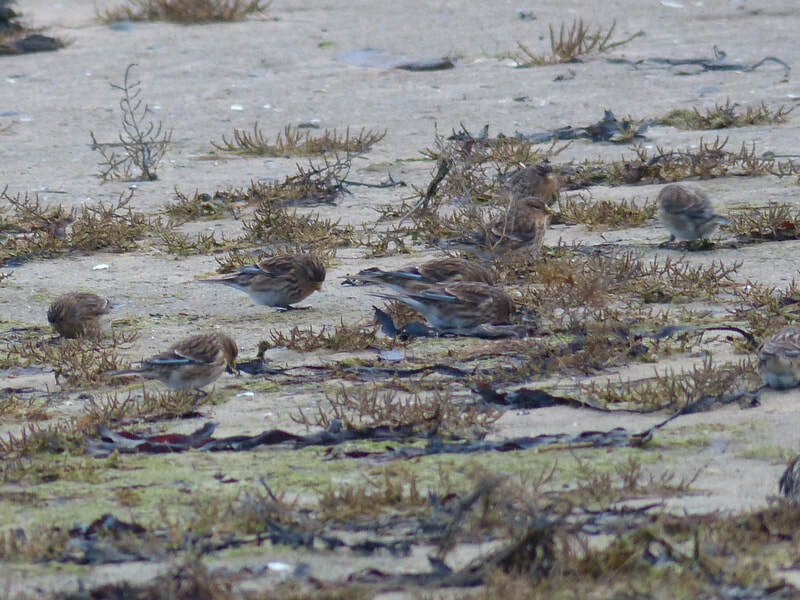 Sutherland: Water Pipit with 6 Rock Pipits on the Saltmarsh by the last Creek at Dornoch point (Dean MacAskill). Easter Ross: Green-winged Teal at Tain Links (Bob Swann). Drake American Wigeon still at Tain links (Mark Dawson). 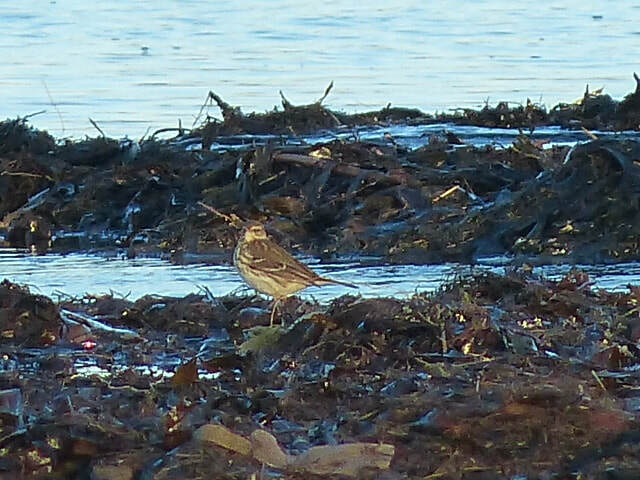 Water Pipit, Dornoch Point (Dean MacAskill). American Wigeon, Tain Links (Mark Dawson). 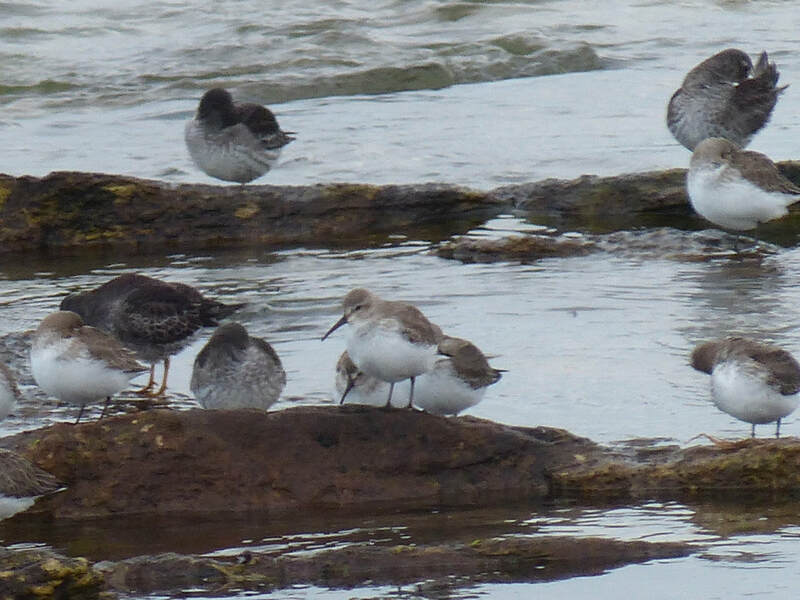 Purple Sandpipers, Embo (Mark Dawson). 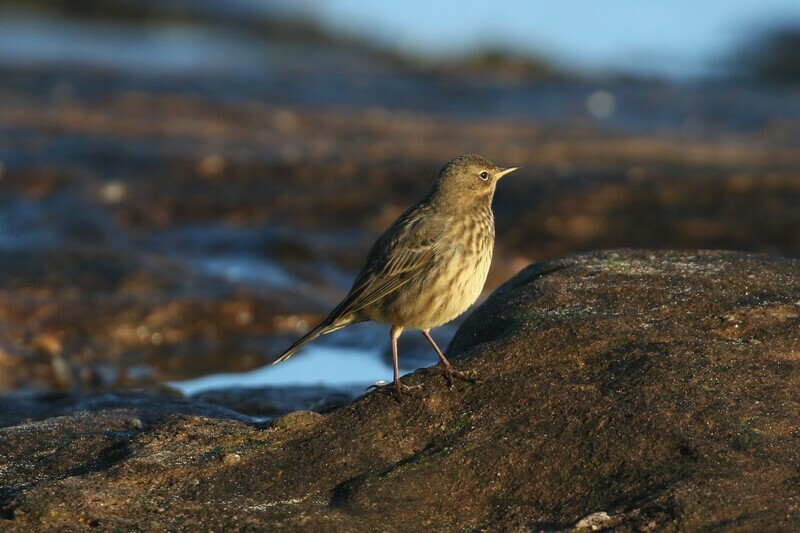 Rock pipit, Embo (Mark Dawson). 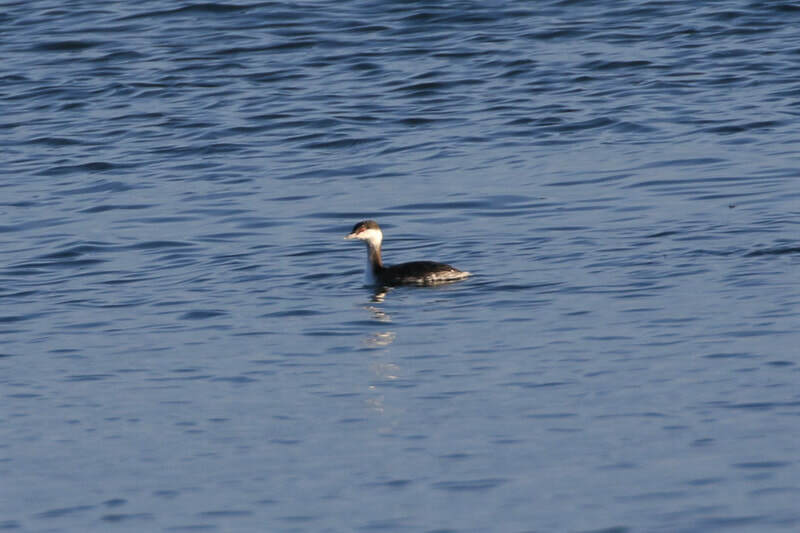 Slavonian Grebe, Embo (Mark Dawson). Inverness-shire: Great crested grebe at Milton of Culloden, looking towards North end of Kessock Bridge. Kingfisher Merkinch LNR on first pool on the right as you walk along Canal Basin (Peter Gordon). Easter Ross: American Wigeon at Tain Links (Bob Swann). 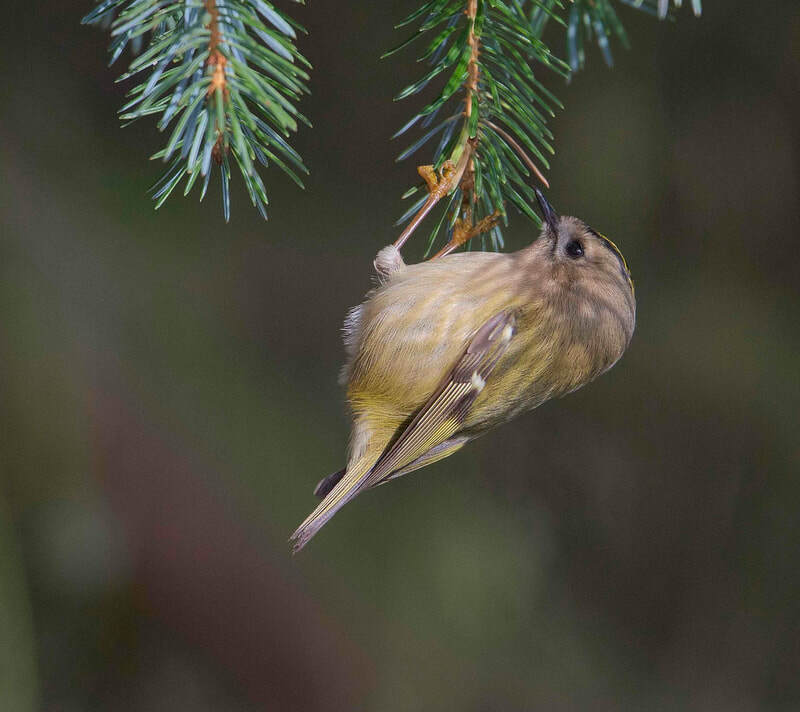 Chiffchaff in gardens on Forsyth Place / Rose Lane / Shore Street, Cromarty (Kevin Davies). Glaucous Gull, Bayfield, Portree, Skye (Neil Bennett). Easter Ross: Green-winged Teal at Tain Links under the footbridge at 10am (Kevin Cuthbert). 16 Pale-bellied brent geese at Rosemarkie burn (Kevin Davies). 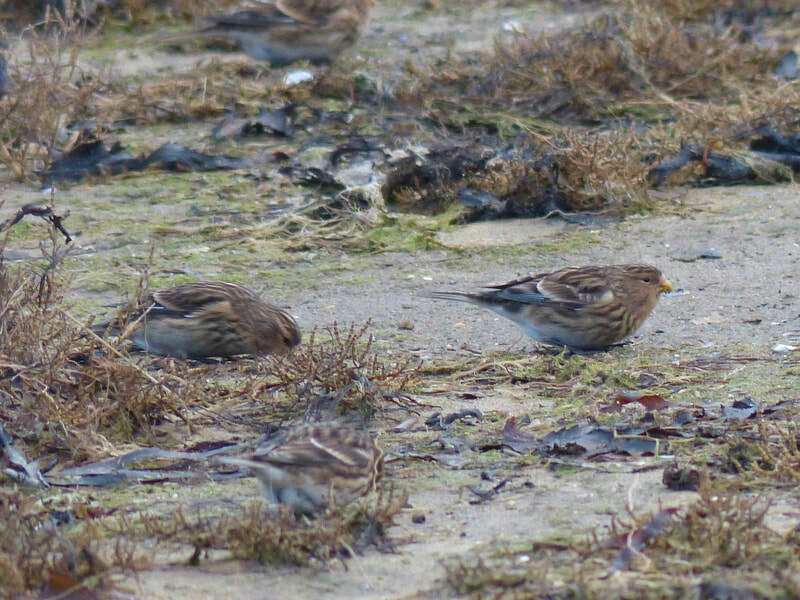 ​Sutherland: Today at Brora river mouth 5 Little Gulls (2 adults and 3 1st winter) also a 1st winter Iceland Gull. At Golspie 5 Barnacle Geese, 1 European White-front with Pink-footed geese flock and at Embo 45 Purple Sandpipers (Dean MacAskill). Skye and Lochalsh: Glaucous Gull at Bayfield, Portree (Neil Bennett). 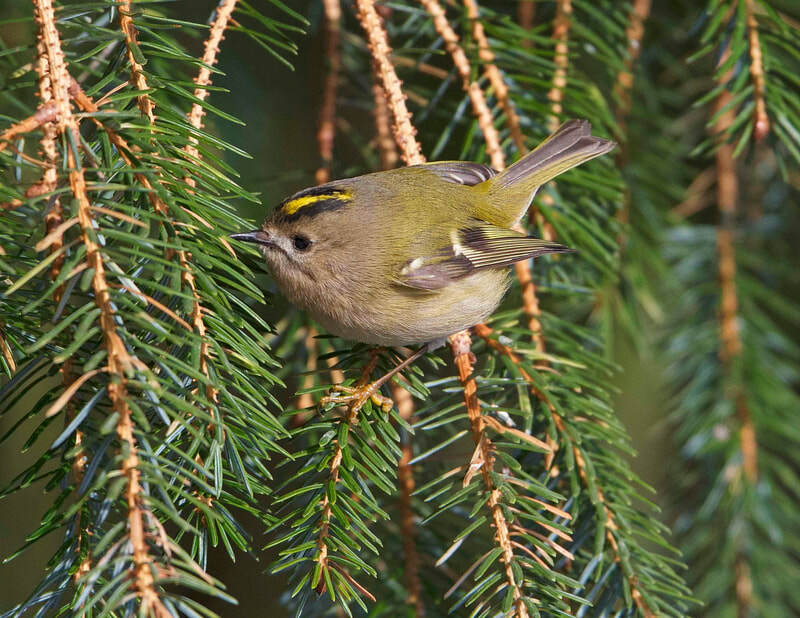 Goldcrest at Muir of Ord (David Edge). 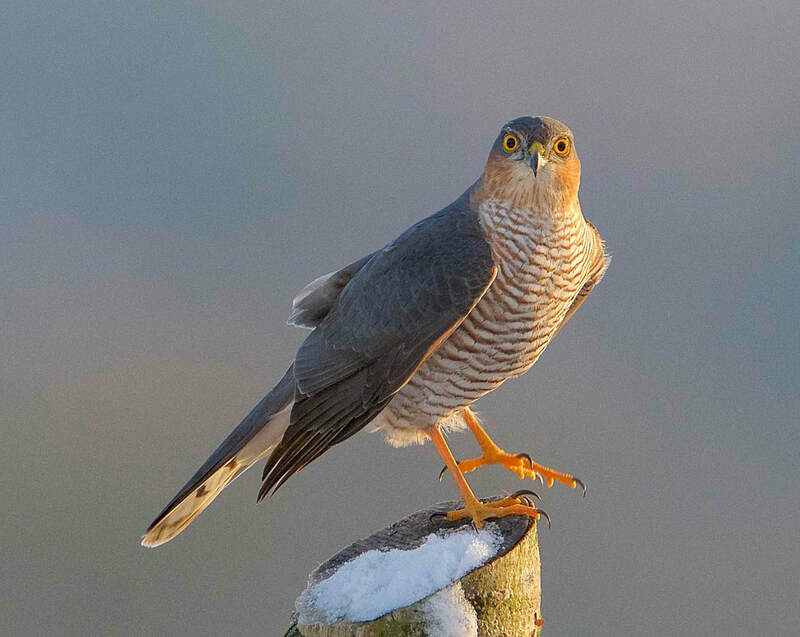 Male Sparrowhawk at Muir of Ord (David Edge). 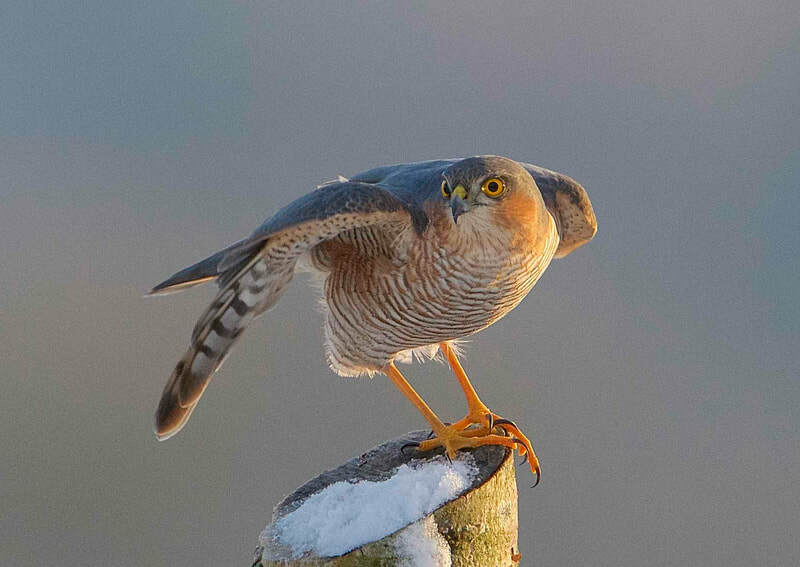 Male Sparrowhawk at Muir of Ord (David Edge)..
Glaucous Gull at Portree (Neil Bennett). 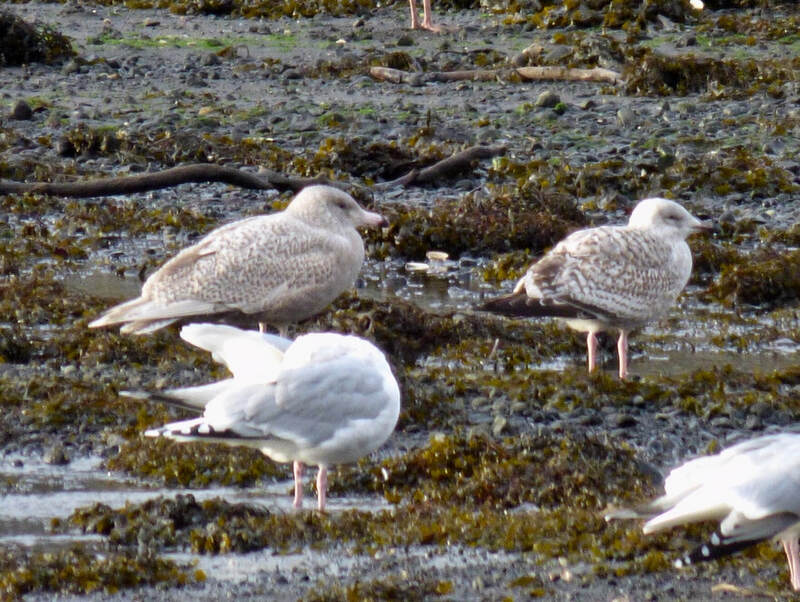 Glaucous Gull at Portree (Neil Bennett)..
Sutherland: Male Hen Harrier, 6 Pale-bellied Brents and 7 Grey Plover at Dornoch Point (Dean MacAskill). 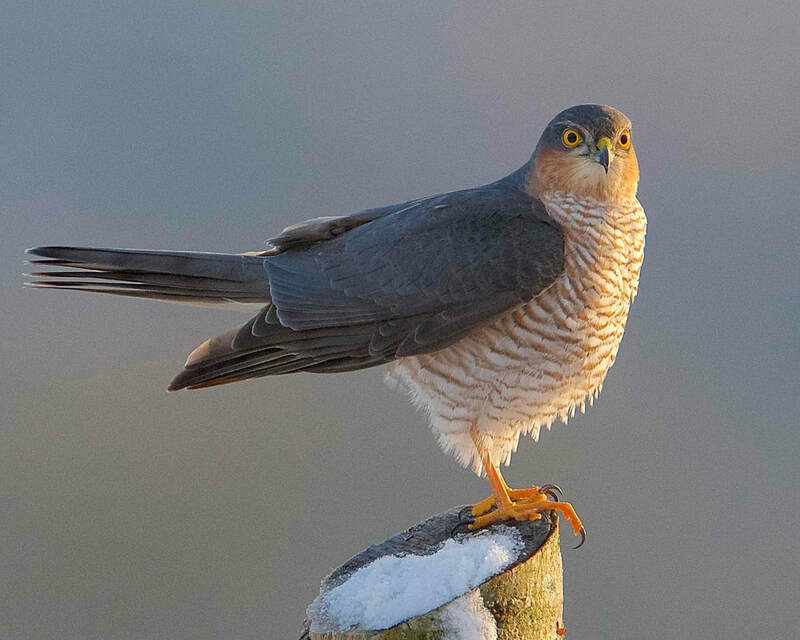 Inverness-shire: Magpie at Alturlie Point (Phil Dowling). 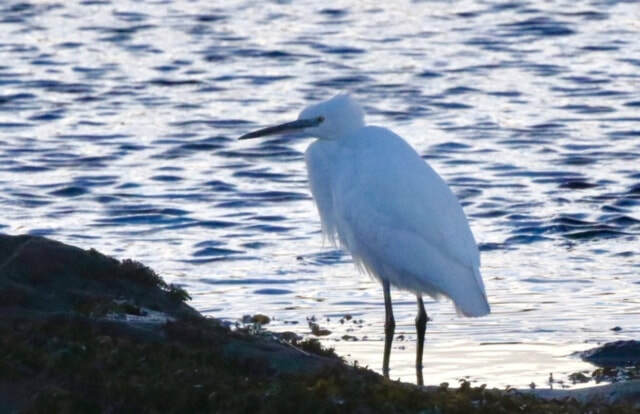 Lochaber: Little Egret at Back of Keppoch (Stuart Crutchfield). 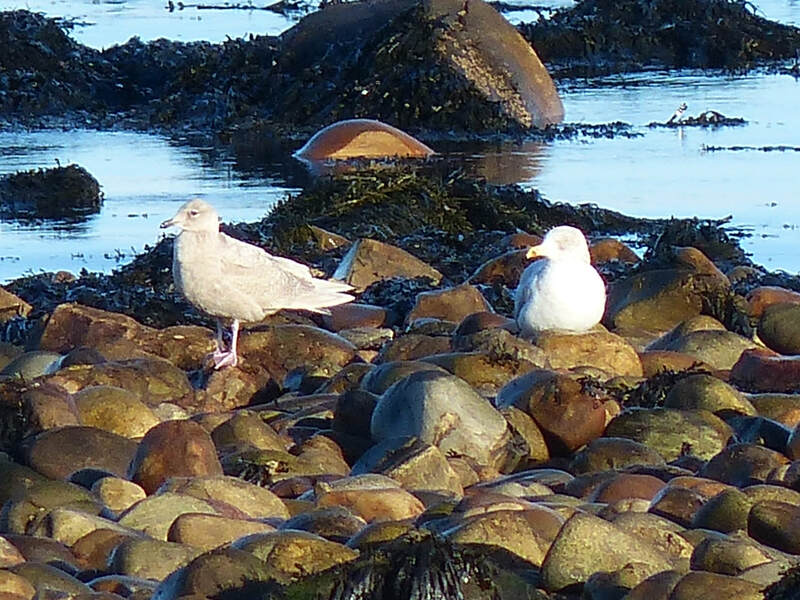 Skye and Lochalsh: Glaucous Gull and Viking Gull on the Black Rock, Portree, this afternoon (Neil Bennett). Inverness-shire: Green-winged Teal at Alturlie Bay (Alison Fraser). Sutherland: 6 Pale-bellied Brent Geese just south of Embo pier on beach this morning (Di Alexander) and later this afternoon (Dave Tanner). 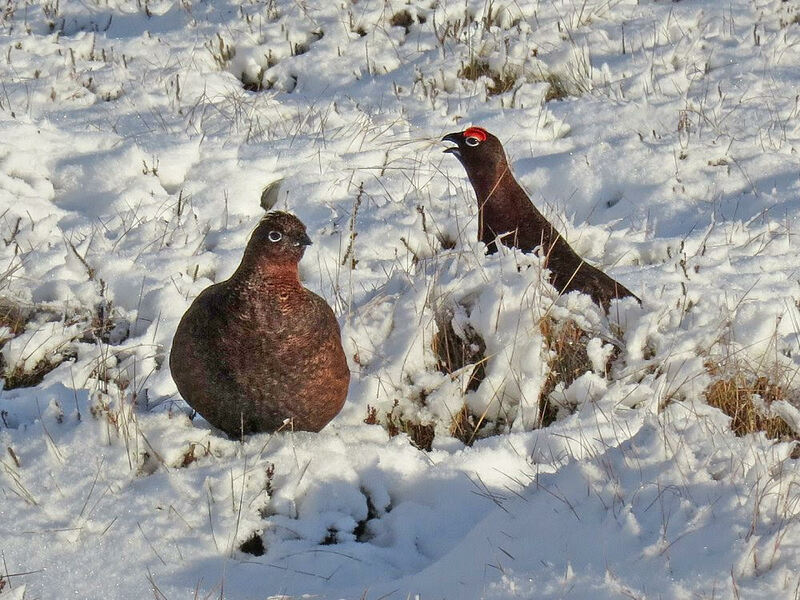 Red Grouse at Lochindorb (Jack Harrison). 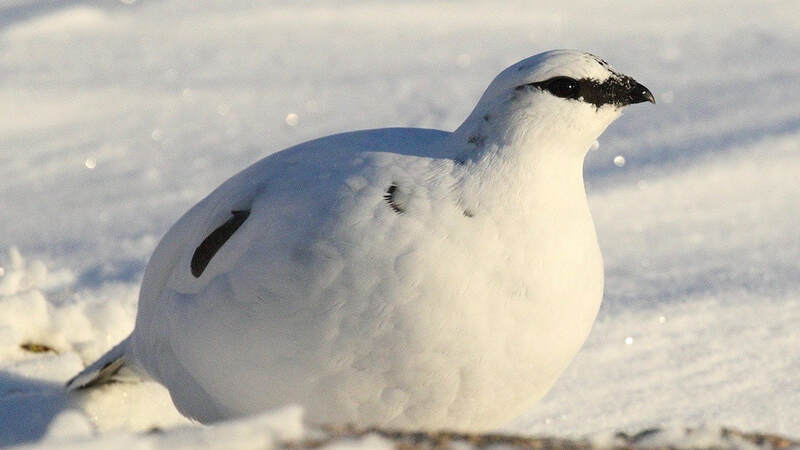 Lochalsh: Adult Mediterranean Gull at Loch Kishorn (Bob McMillan). Easter Ross: 9 Pale-bellied Brents at Rosemarie Burn this morning (Mary Galloway). 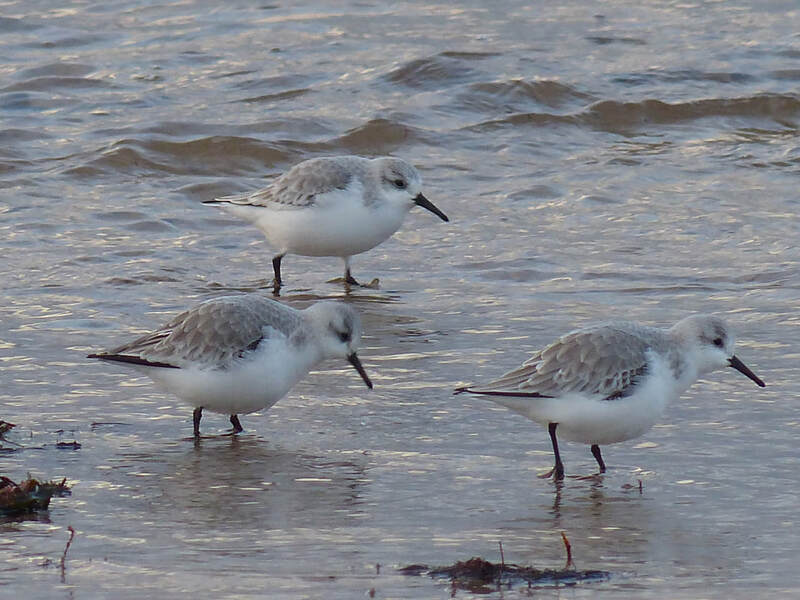 Sutherland: Adult and first-winter Little Gull at Brora river mouth (Dean MacAskill). 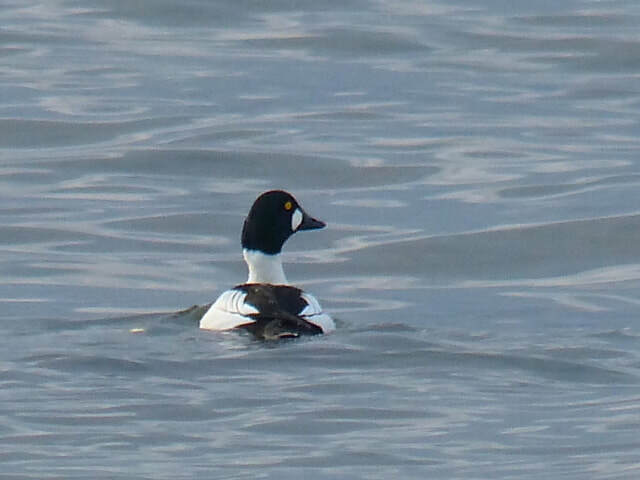 ​Easter Ross: Drake American Wigeon still at Tain links (RBA). Sutherland: Two Barnacle Geese with pink-feet in fields by A9 near Loch Evelix here at Cuthill (Dean MacAskill). Two Barnacle Geese and a European White-fronted Goose at Golspie viewed from Kirkton Farm track (Dean MacAskill). Wester Ross: White-billed Diver on Little Loch Broom viewed from the lay-by here (Scott O'Hara, George Gay). Inverness-shire: Greenland White-fronted Goose with Pink-feet just northeast of Loch Flemington this afternoon at NH815530 (Al McNee). Badenoch and Strathspey: Hybrid Canada x Greylag goose and a Barnacle Goose at Cromdale Kirk today (Thomas Plant, Kevin Cuthbert). Inverness-shire: 10 Barnacle Geese with large Pink-feet flock at Gollanfield (Colin Leslie). 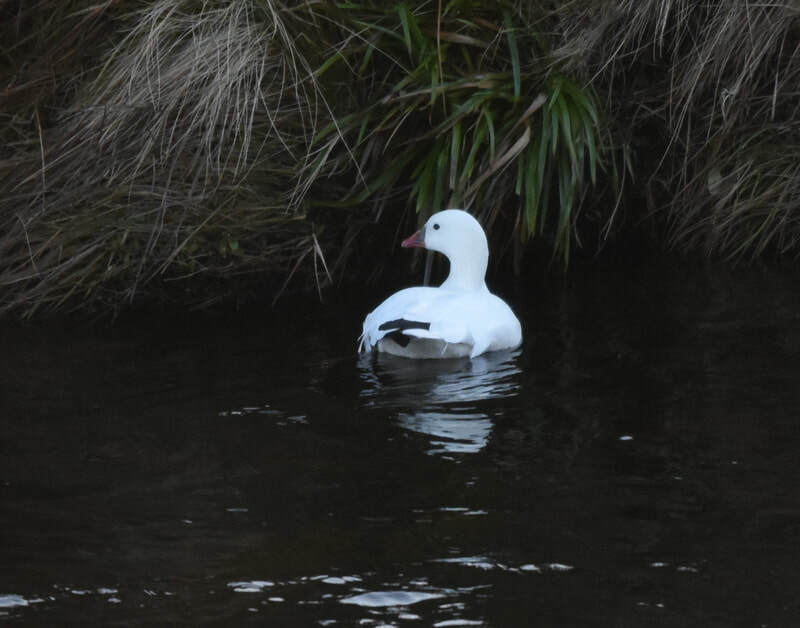 Easter Ross: Intermediate morph Snow Goose still on the Black Isle at Killen with pink-feet flock at 1211pm (George Gay). Two Barnacle Geese northeast of Munlochy here (Phil Dowling). Easter Ross: Single Waxwing on the Black Isle in berry bushes on minor road here near Knockbain (Kate Clarke, Mary Galloway). 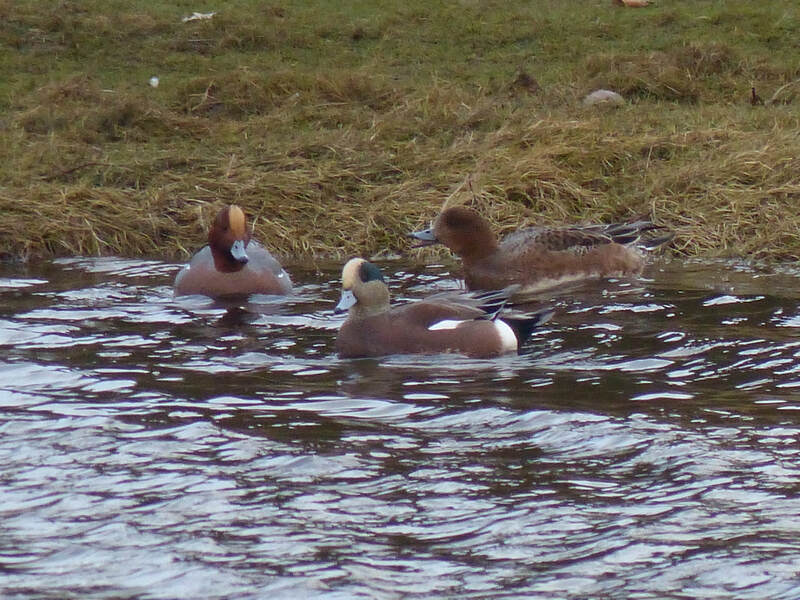 American Wigeon still at Tain near footbridge at 1220pm (Peter Stronach, Jon and Kate Clarke). Intermediate morph Snow Goose still on the Black Isle at Killen with pink-feet flock at midday (RBA). Inverness-shire: Two Barnacle Geese with 500 Pink-feet viewable from Loch flemington to the north (Pete Gordon). 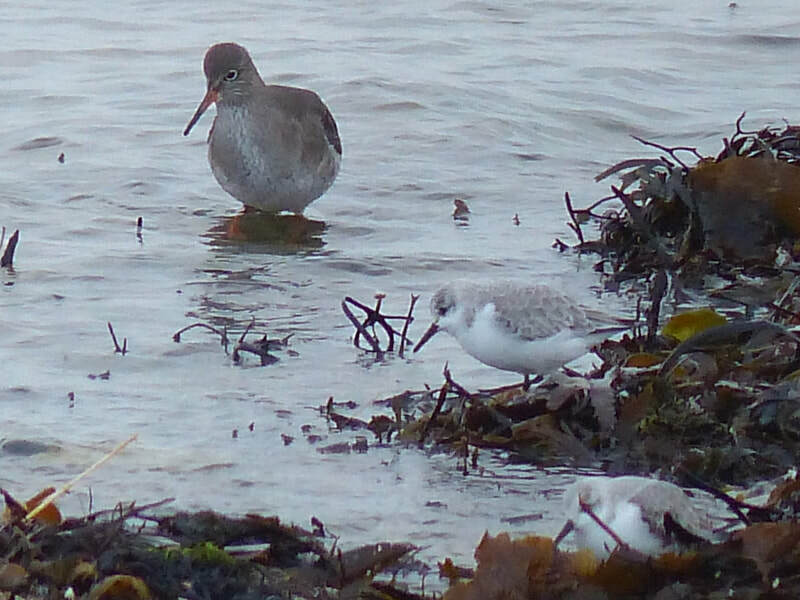 Two Black-tailed Godwit at Merkinch (Pete Gordon). 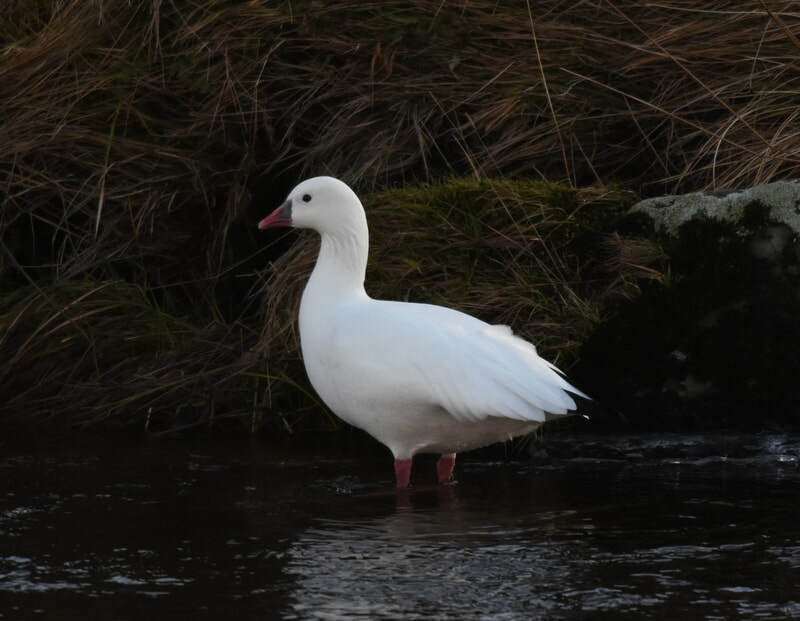 Easter Ross: Intermediate morph Snow Goose still on the Black Isle at Killen with pink-feet flock at midday (Dave Tanner). Goldeneye at Dornoch (Dean MacAskill). 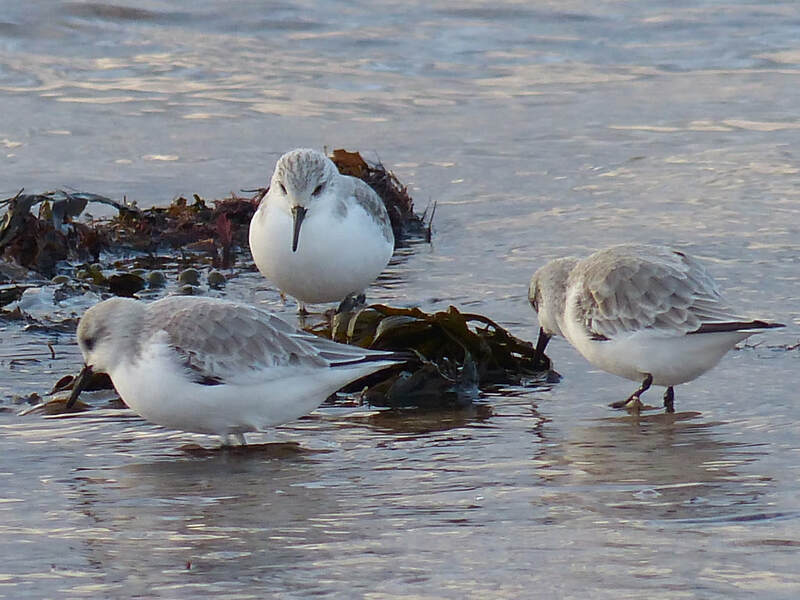 Sanderling at Dornoch (Dean MacAskill). Sutherland: Spotted Redshank again at the head of the Dornoch Firth between Bonar Bridge and Ardgay (Mike Hoit). Nordic Jackdaw at Dornoch (Dean MacAskill). Easter Ross: American Wigeon still at Tain near footbridge at 1220pm (Mike Hoit), also 3 Shoveler there (Dean MacAskill). American Wigeon still at Loch Eye and Two Black-tailed Godwits at Inver (Dean MacAskill). Snow Goose still in field at Killen with pink-feet (Bob Wilson). Lochaber: Drake Ring-necked Duck still at Acharacle with Tufted Ducks viewed from Acharacle Pier (Bob McMillan). 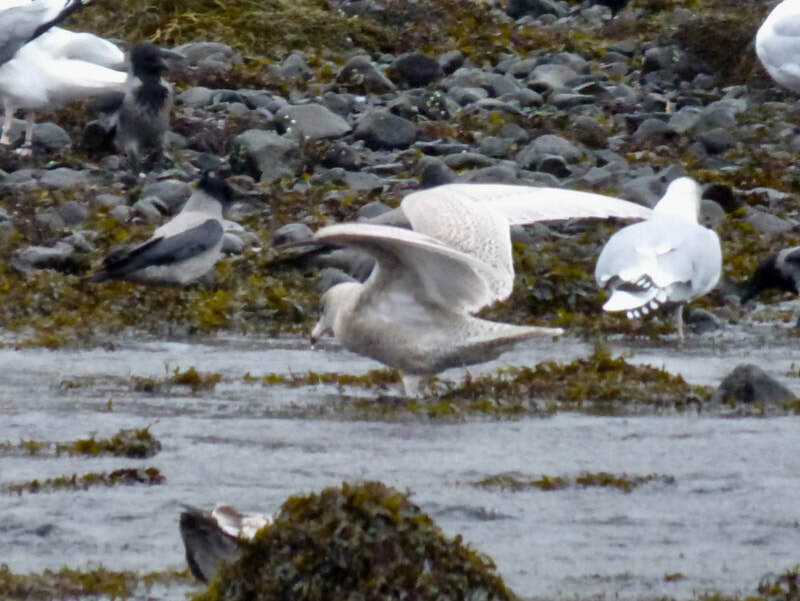 Juvenile Iceland Gull at Lochailort still (RBA). American Wigeon at Tain (Dean MacAskill). 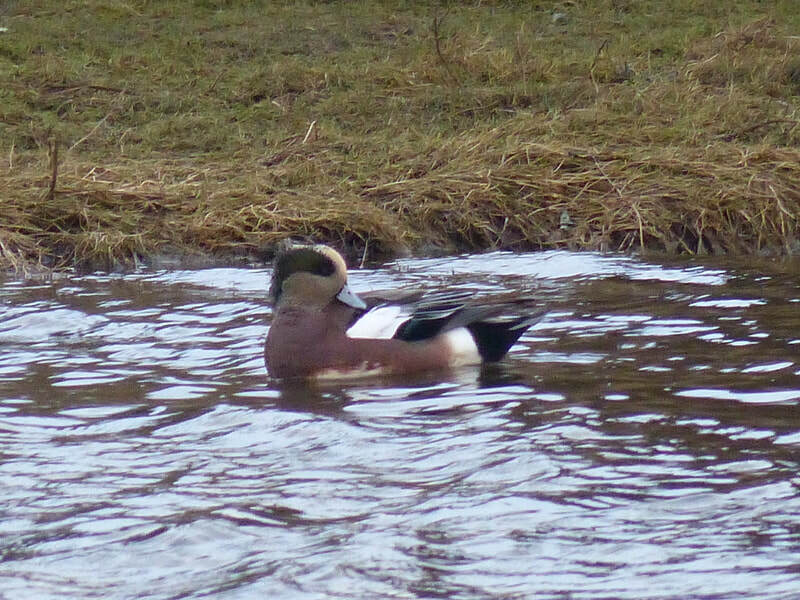 Easter Ross: American Wigeon still present just upstream of the footbridge at Tain links this afternoon (Toby Green). Sutherland: European White-fronted Goose with pink-feet flock adjacent to Balblair Wood near Golspie here (Toby Green). Greenland White-fronted Goose with pink-feet flock by Golspie Golf Course here. Intermediate morph Snow Goose still at Killen in field opposite the village itself. 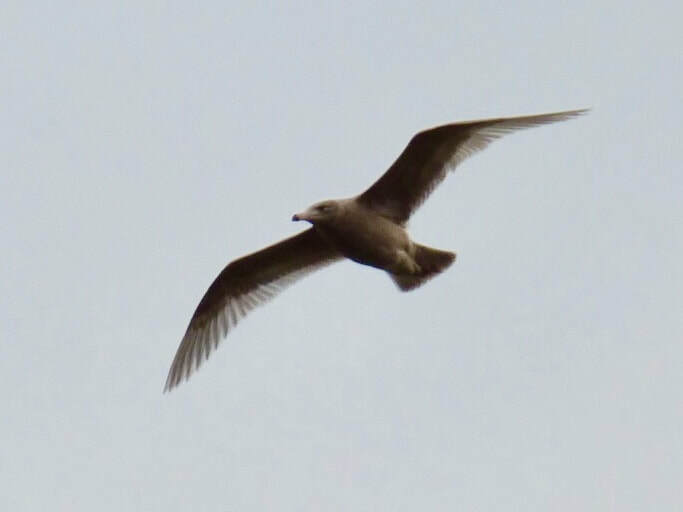 Lochaber: First-winter Iceland Gull at Ardnish Fish Farm (Stuart Crutchfield). 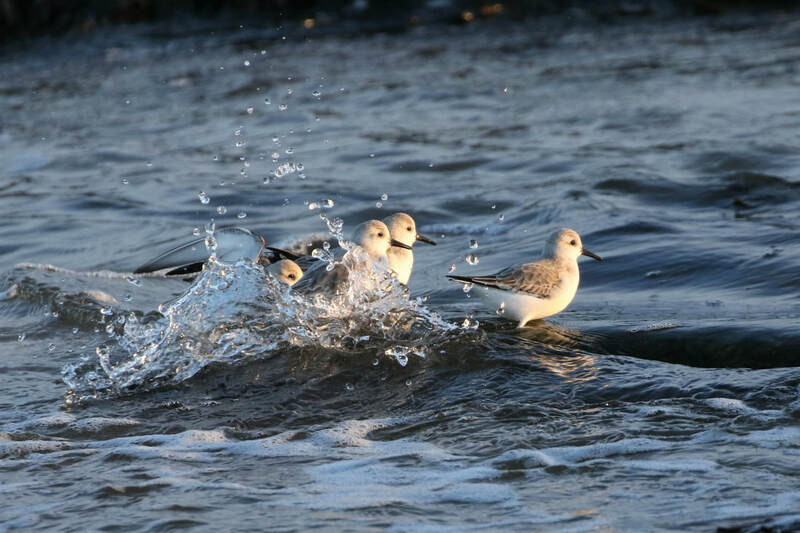 Sutherland: Three adult Little Gulls and a first-winter north past Brora river mouth at midday (Dean MacAskill). 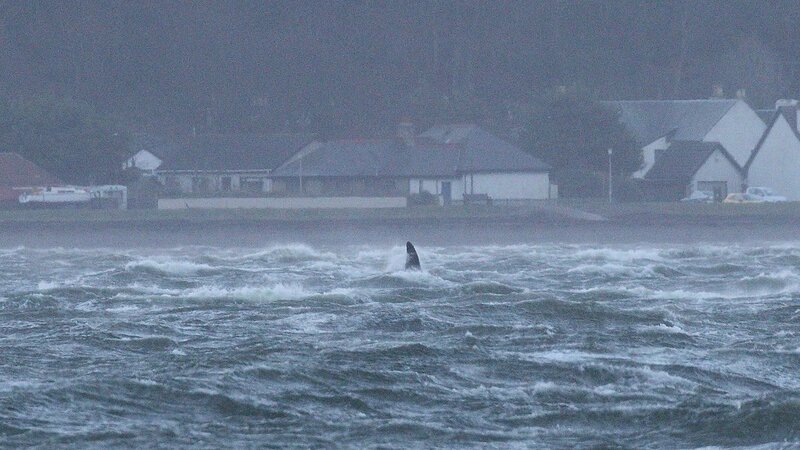 Two Orcas from the West Coast Community, John Coe and Aquarius were seen in the Inner Moray Firth today between Chanonry Point and Fort George. Sutherland: 2 adult Little Gulls at Brora off the river mouth (R Hughes, N O'Hanlon). 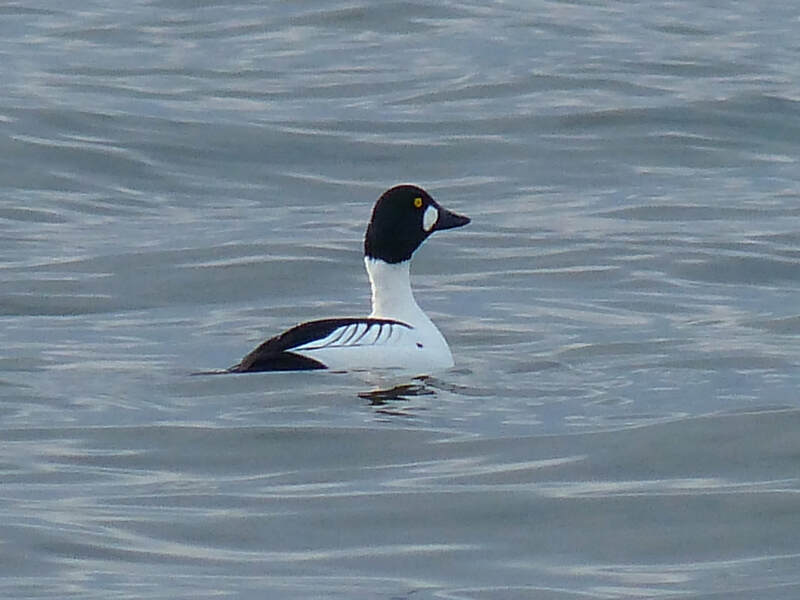 Easter Ross: 23 Slavonian Grebes off Embo and 5000 Common Scoter, 300 Eider, 300 Long-tailed Duck, 26 Slavonian Grebes off Dornoch (Dean MacAskill). Intermediate morph Snow Goose still on the Black Isle and 2 Barnacle Geese, in the field on the right as you come into Killen from the Munlochy side (Blair Whyte, Mary Galloway, Pete Gordon). American Wigeon still at Tain links. Green-winged Teal reported at Munlochy Bay today (WeBs). Easter Ross: Kingfisher off Dalmore at high tide (Bob Swann). 2 Waxwings at Garve at 0947am (Andy Williams). Easter Ross: 4,200 Common Scoters, several Velvet Scoter, 300 Eider, 150 Long-tailed Duck from the bench above Dornoch beach carpark (Dean MacAskill). Skye and Lochalsh: Juvenile Glaucous Gull at Bayfield, Portree (Bob McMillan). Little Egret at Arisag front, also possible second bird at Back of Keppoch. Kingfisher at Morar river, Mandarin on Morar pool (John Chester and Niki Robertson). 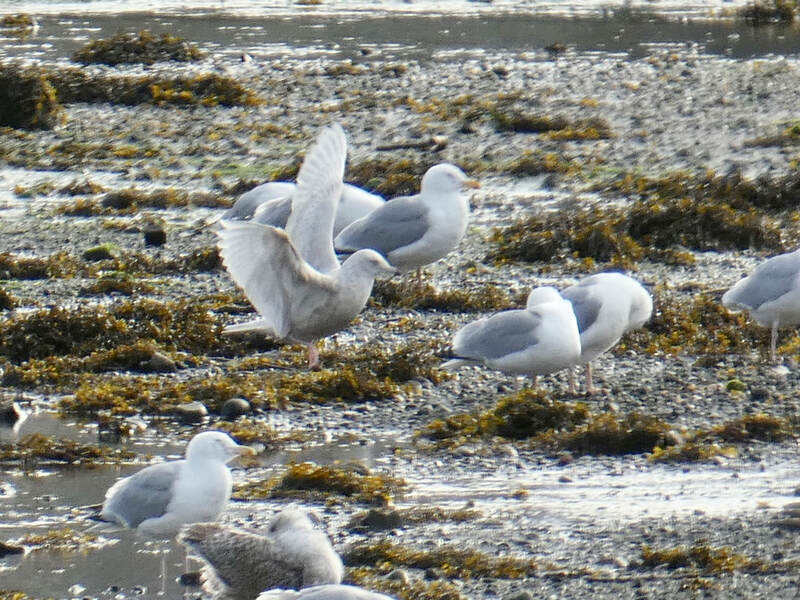 Wester Ross: Adult Viking Gull still at Ullapool (Andy Williams). 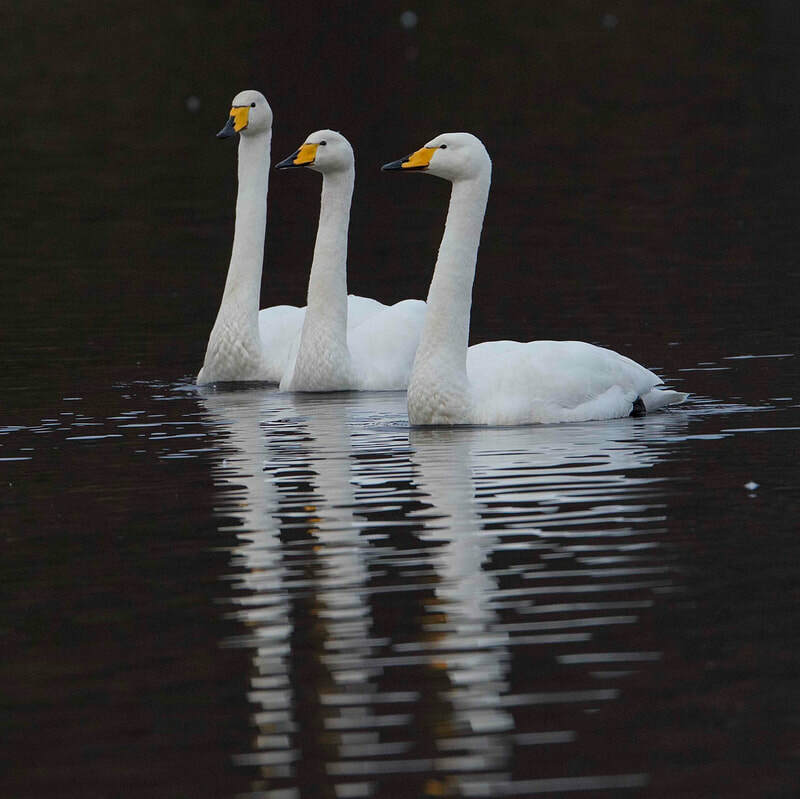 Whooper Swans at Loch Evelix (David Edge). 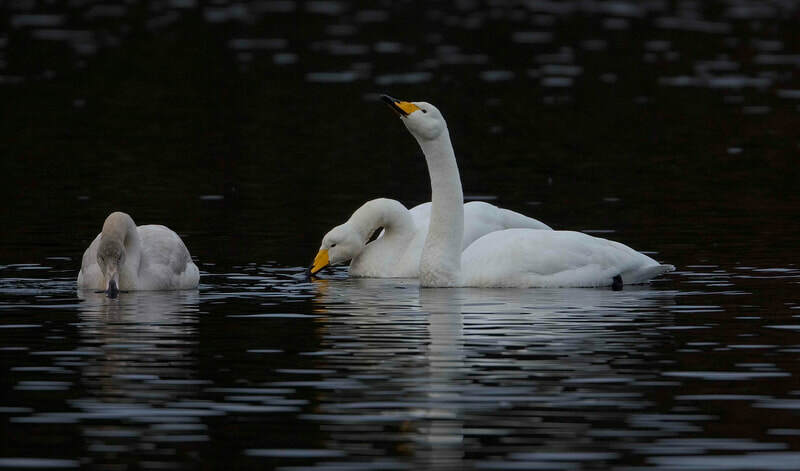 Whooper Swans at Loch Evelix (David Edge)..
Twite at Dornoch (Dean MacAskill). Easter Ross: Drake American Wigeon again at Tain Links and 22 Shoveler, no sign of the Green-winged Teal (Bob Swann). Inverness-shire: Green-winged Teal still at Loch Flemington (Bob Wilson). 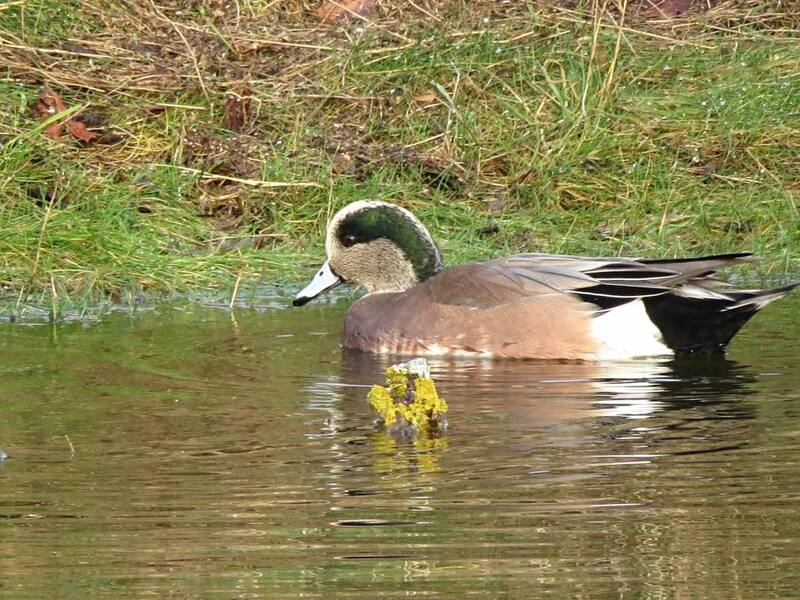 Easter Ross: Drake American Wigeon still at Loch Eye today (Bob Swann). Inverness-shire: Drake Green-winged Teal back on Loch Flemington again this afternoon with only 6 Teal (Jon Clarke). 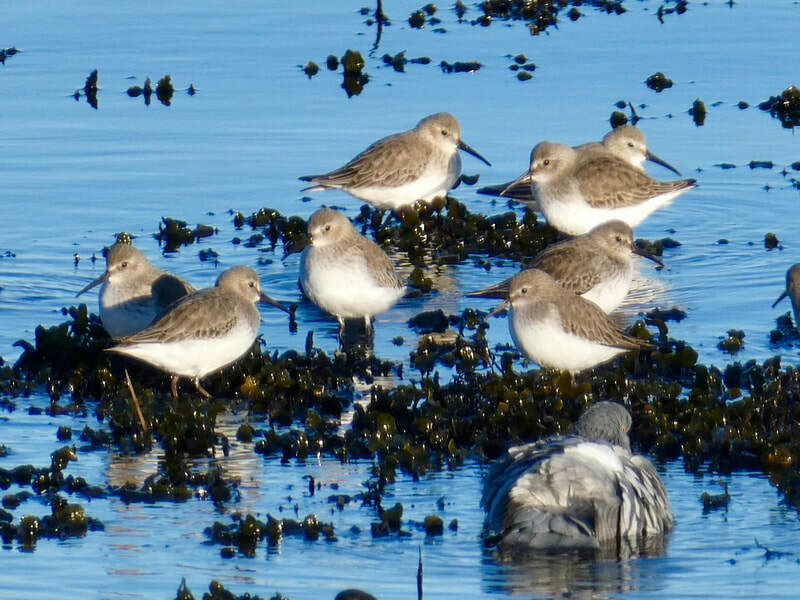 Kingfisher and four Black-tailed Godwit still at Muirtown Pools late afternoon (Al McNee).